Crystals | How do Crystals Work? It is obvious from what we know of the make up of Crystals, therefore, that Crystals vibrate at very precise frequencies. Vibrations are the means by which we communicate, whether we communicate by voice (using the vibrations of the voice box) or hearing using the receptors in the ear to translate the speech vibrations. Radio and TV produce sound waves and pictures in a similar way. Therefore as vibrations are in the form of energy fields which science describes as being capable of 'storing and retrieving' information as required, commonsense dictates that energy fields surround all matter. We know this energy field as the Aura. Crystals have auras too. Science also provides us with the information that this energy field (aura) can penetrate the skin structure. In the same way the energy field of a crystal can pass through the skin and, can therefore, assist in the healing process. The developement of Lasers to produce holographic images (the three-dimensional projections which seem to be 'really there') has interested Neuroscientists. As a result they are working on theories based on holographic models to explain some of the ways of storing memory in the brain. As rubies are a vital component of lasers we can see that crystals have the facility of memory. This being so, they can, therefore be programmed for certain usage. It has also been established scientifically that positive uplifting thoughts raise the frequency of the energy field, while negative thinking and acting lowers the frequency. Everything vibrates at different frequencies. Objects that we can see, including the human body vibrate at a speed that can be seen by our eyes. The aura, however, vibrates much faster so we cannot see it as a matter of course. The eye can be trained to see auras. Animals including Humans have a physical body that is tangible and that can be treated by a doctor if it becomes injured or ill. Along side this we also have a subtle energy body that interacts with the physical. If the subtle energies become blocked or sluggish the body is thrown out of balance and eventually a physical illness will manifest. The Subtle Energy system is made up of The Aura, The Chakras and The Meridians. Emotional trauma, life events, stress and strain on the physical body are amongst the things that can create these energy blocks. By using the vibrations from the crystals we can restore the natural balance and remove these blockages. 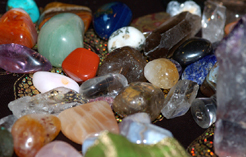 What is a Crystal Healing? Crystal healing comes under the umbrella of complimentary therapy. it is known as a vibrational therapy because it works on the subtle energy systems of the body. Crystals are energising therefore their powerful energies could prove too stimulating to treat certain conditions. However some of these patients might well benefit from very short treatments using the gentler crystals such as Rose Quartz.